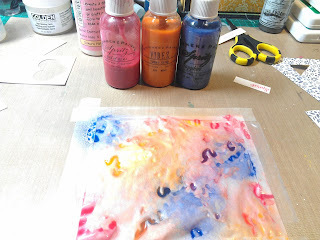 i have a step by step tutorial for you today here on how to create custom backgrounds to suit your project, make DIY embellishments and use them on a 12x12 layout. i have sprayed a few areas with different colours to get the look i wanted. * vellum will curl once it gets moisture on it - it helps if you tape it down to your desk surface first. 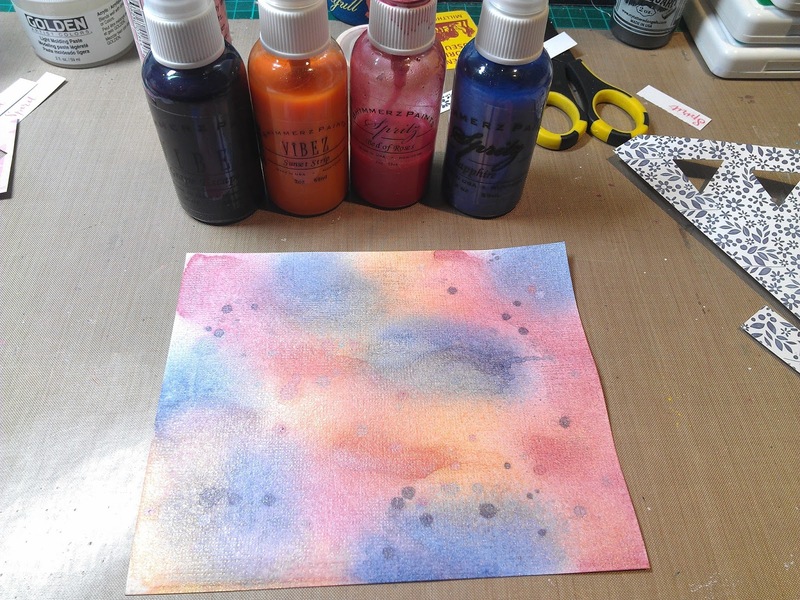 * for more intense colour add a couple of layers of ink, but dry between applications. vellum will get distorted and will get lots of bumps and creases - this gives it an interesting texture, but if you are after a flat look, unfortunately you won't be able to straighten it. Repeat the above process on a piece of White cardstock. 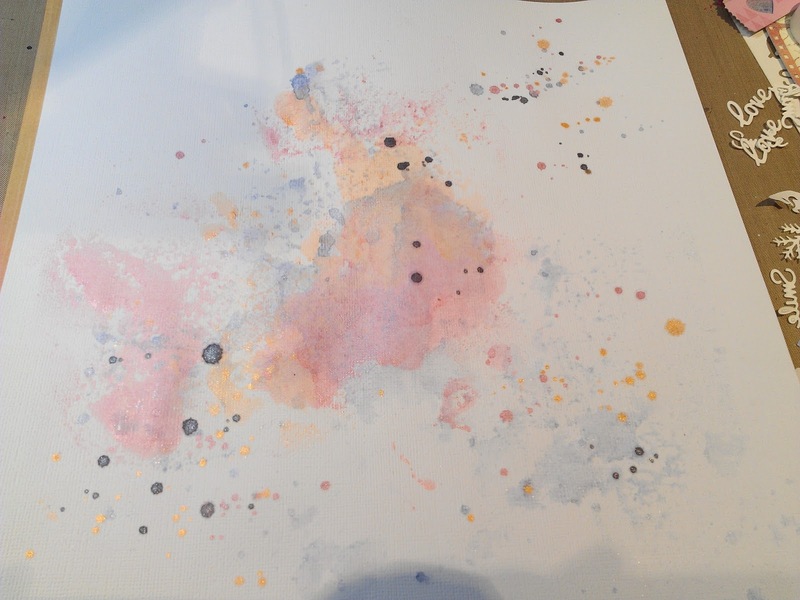 I have sprayed it lightly with water first to help colours blend together a bit easier and not soak into the paper straight away. Make sure both paper and vellum are completely dry before proceeding to the next step of cutting out shapes from them, otherwise dies and punches will chew the paper. Once all was dry, i have taken some paper punches and some dies and cut out a few shapes that i think i might use. 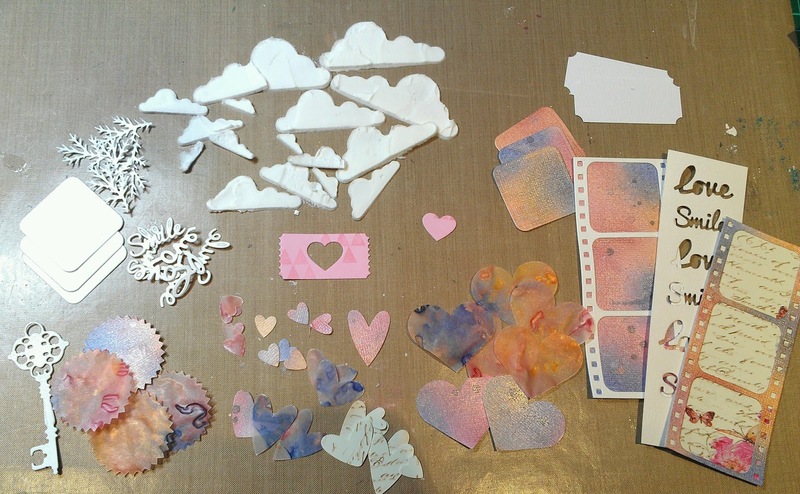 I have also punched out shapes from while cardstock and white Canvas Paper (which i found at a local craft store) - for delicate shapes make sure you use thick and heavy duty cardstock, otherwise your shapes might tear. I have added a few other things from left overs from my stash eg text prima packaging which i have used to back the film strip diecut with. I have die cut words Love and Smile a few times from a strip of Canvas paper and have also kept the negatives which i can use in a future project. 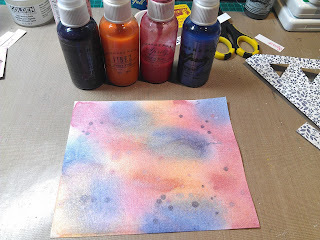 I have prepped a white cardstock with some more of the Shimmerz inks in same colours as previously and used packaging technique to add colour to background, then added some splatters. I have backed the White Background cardstock with some paper from Maggie Holmes "Shine" Paper pad but only on left side and bottom of the page. Added some clusters of paper which are a combination of Shine and Fancy Free collections and fussy cut some florals from Shine paper. 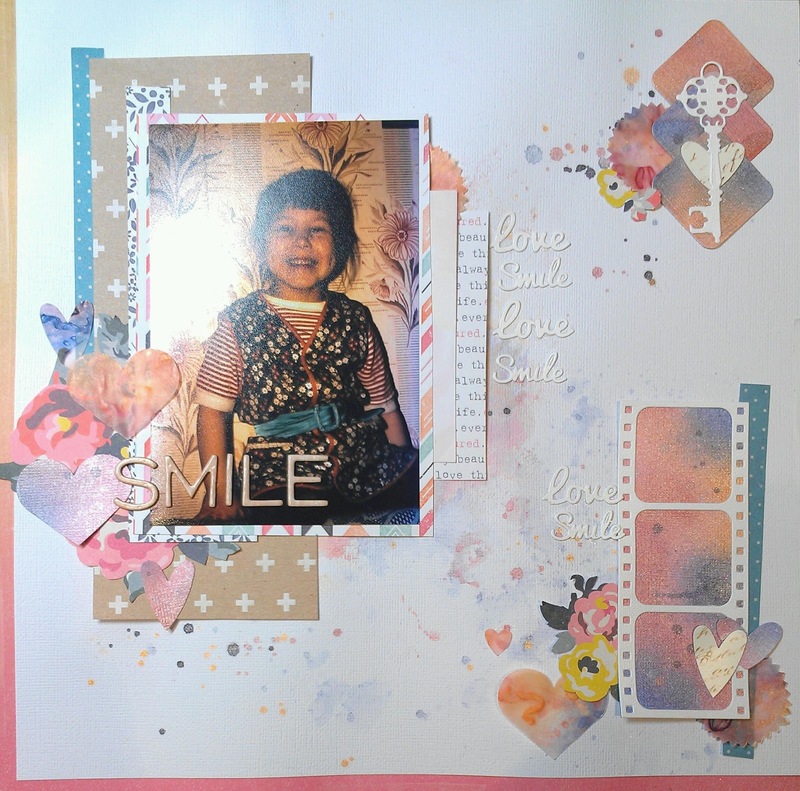 I have used all of the Love and Smile words i have die cut and layered them next to photo cluster and lower right embellishment cluster - it is a tone on tone look having white on white but it adds suble texture and interest to the page. Finally i have added my Title "Smile" with some old American Crafts Thickers and Voila! the page is complete. Hope you enjoyed this tutorial and if you have any questions, leave me a comment!